Oregon State University Ecampus is the innovative and highly regarded online education division of Oregon State University. U.S. News & World Report has ranked OSU Ecampus top 10 in the nation three straight years in the category of Best Online Bachelor’s Programs. Ecampus delivers nearly 50 undergraduate and graduate programs online to learners in all 50 states and more than 50 countries. Challenge: Online education is a highly competitive vertical. Ecampus needed to find ways to increase enrollment while remaining fiscally responsible. An added challenge with this client is constructing search campaigns that do not cannibalize from other university units. 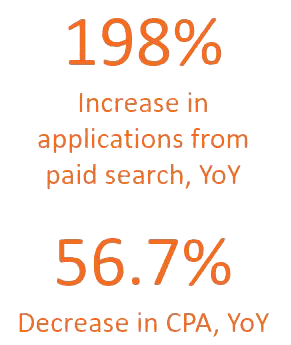 Goal: Increase the number of applications received for online programs without cannibalizing traffic from OSU’s main campus in Corvallis or the OSU-Cascades campus in Bend. Strategy: Anvil created a multi-layered digital marketing strategy for Ecampus that leveraged paid search, paid social, display, video, and remarketing to reach potential students across the country. A robust list of negative keywords were implemented to avoid irrelevant queries and direct search traffic to the most qualified landing page. Anvil worked with the Ecampus marketing team to determine which of their 50+ online programs could support its own marketing efforts and which ones would need the help of a broad campaign to flourish.